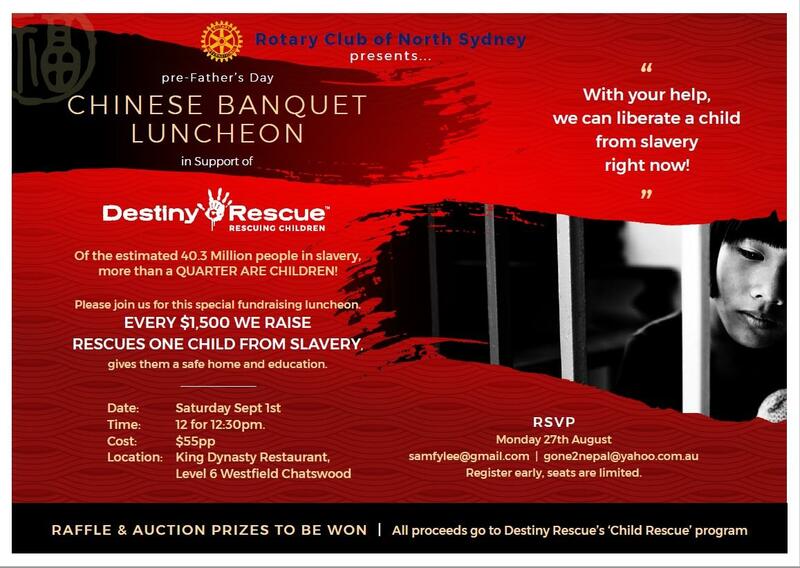 The Rotary Club of North Sydney invites you to a pre-Father's Day Chinese Banquet Luncheon to help End Child Slavery! SBS Dateline recently featured a story on how Destiny Rescue works in Southeast Asia to rescue children from a life of slavery and exploitation. (Watch: "How to Catch a Pimp"). Every $1500 we raise gives them the necessary funds to rescue a child and continue this important work. See the brochure below for our luncheon details and come along! OR better still get a group of family and friends and celebrate together! We can do something to give a child the freedom of a new destiny; hope you can help!